Edward Snowden accused the National Security Agency and the U.S. government today of "setting fire to the future of the Internet." 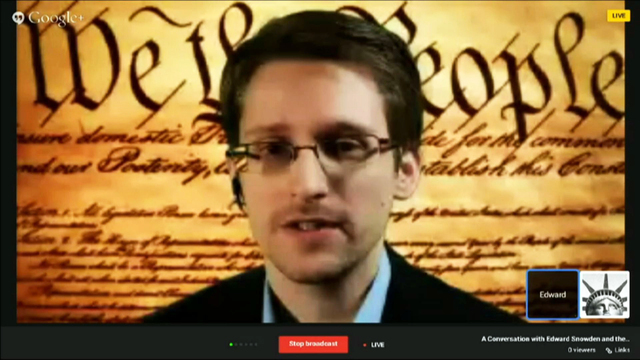 In a high-profile video appearance at the South by Southwest festival -- his video was beamed over Google Hangout from Russia to Austin, Texas, apparently, the moderator joked, through "seven proxies" -- Snowden touched on myriad topics, ranging from privacy to the ramifications of government spying, as he answered questions from the Internet at large via Twitter. "The NSA...they're setting fire to the future of the Internet. And the people in this room, you guys are the firefighters. We need you to help us fix this," Snowden said. Moderator Ben Wizner, the director of the ACLU's Speech, Privacy and Technology Project, said that Snowden's actions have led to a "reinvigorated" interest in government oversight. "Sometimes it needs serious sweeping, and Ed Snowden's been the broom," Wizner said. One of the first questions that Wizner asked Snowden was why he was addressing the technorati at South by Southwest instead of the policy wonks in Washington, D.C.
"The tech community are the ones who could help fix this situation, more than people in Washington," Snowden said. "There's a tech response needed. It's the makers, thinkers, and the dev community who can help make sure we're safe." Christopher Soghoian, a privacy advocate and principal technologist at the American Civil Liberties Union, was onstage with Wizner in Austin. He agreed with Snowden that the tech community and technology companies have improved their use of encryption, which often have been lackadaisical about implementing it. "We need to lock things down and make things secure out of the box. Developers will have to think differently," he said. Snowden said that the value of encryption can't be understated, and claimed that the U.S. government remains unsure of which documents he leaked. "They have no idea what documents were provided to journalists, because encryption works," he said. "We need to think about it not as an arcane dark art, but a protection against the dark arts." The trio discussed the possibility of the NSA breaking encryption, but Snowden said he doesn't think that's likely. A bigger threat to encryption than government breaking encryption, Snowden said, is simply stealing the encryption keys. "I think encryption will be sustained unless we make massive leaps in understanding math and physics," he said. Soghoian said that the cryptographic community felt it had been lied to, in part because of a lack of motivation to toughen encryption. Soghoian had harsh words for broad swath of technology firms, including Google for data collection via Android and Chrome, Facebook for data collection and privacy violations, Apple for making its address book insecure, Yahoo for not implementing encryption sooner, and Mozilla for not making Firefox secure enough. "The irony that we are using Google Hangouts to talk to Snowden is not being lost on me," he said, and he also noted their response to the documents Snowden leaked. "Unfortunately it took the largest whistle-blower in history to get these companies to prioritize their customer's privacy," Soghoian said. A major difference between corporate data collection and government spying, Soghoian and Snowden agreed, is that you can't challenge government spying in court. "If data is being clandestinely acquired and the public or courts have no way of reviewing it, that's a problem," Snowden said. Another problem with the U.S. government spying on its citizens was that it made it difficult to stop actual terrorist threats. "Tamerlan Tsarnaev was known by the Russians. If we'd focused on traditional intelligence, not mass surveillance, we might've stopped him," Snowden said of the suspected mastermind behind last year's Boston Marathon bombings, who was later killed in a shootout with the Boston police. "The goal here isn't to blind the NSA. The goal here is to make it so that they cannot spy on innocent people because they can," Soghoian added. Wizner let Tim Berners-Lee, the World Wide Web founder, ask Snowden the first audience question. He thanked Snowden and said that what Snowden has done is profoundly in the public interest. He also asked what should be done to improve the government surveillance practices. Snowden replied that the problem was not with the system, but its implementation. "We have an oversight model that could work. The problem is when the overseers in Congress, NSA, who don't want to do oversight." The main issue, he said, is "accountability." "We can't have people like [Director of National Intelligence James] Clapper lying to Congress." Snowden closed by reiterating his intention by going to Glenn Greenwald and Laura Poitras with the NSA documents. "When I came public it wasn't to single-handedly change the government. I wanted to inform the public so they could make their own decision," he said. "Regardless of what happens to me, this is something we had a right to. I took an oath to support and defend the Constitution and I saw that the Constitution was being violated on a massive scale," he said. Seth Rosenblatt is a senior editor at CNET, and has written about nearly every category of software and app available. At CNET since 2006, he currently focuses on browsers, security, and operating systems, with occasional forays into tech and pop culture.